(Nanowerk News) A new semiconducting material that is only three atomic layers thick that exhibits electronic properties beyond traditional semiconductors has been developed. Two nano-engineered configurations of the material have shown an enhanced response to light. 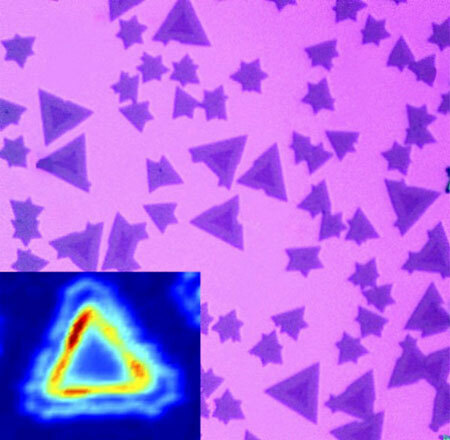 Optical microscope image of triangular-shaped metal-diselenide monolayer hetero-structures. The central portion containing molybdenum atoms appears darker than the outer portion with tungsten atoms. Inset is a photoluminescence intensity map showing that the linear junction region along the triangular interface produces enhanced light emission (red region). Layered materials at the atomic limit, where electrons are constrained to two dimensions, can be engineered into electronic structures with unique optical, electronic, and magnetic properties. The new structures are a test bed for theories of low dimensional materials physics, but more practically, the optical manipulation of electron charge and magnetic order can lead to new modes of solar energy conversion and flexible, transparent computation devices. A new ultra-thin semiconducting material consists of three atomic layers in an “atomic sandwich” configuration with a heavy metal atom layer between two selenium layers. The material is quasi-two dimensional, just three atoms thick, and exhibits unique properties at junctions. When the material is exposed to light and absorbs photons, excited electrons are created which remain coherently coupled, in unique ways, with the charge “hole” they left behind. Stacking up two “atomic sandwiches” yields coupled excited charge states across the planar interface with the magnetic direction or “spin state” becoming aligned for a large population of electrons. A companion result by the same research group demonstrated a method to make the edge of one metal layer match up with the edge of a second, different metal layer -- a linear boundary or “hetero-junction” rather than the more typical planar boundary. Engineered electron spin and charge polarization, as well as transport across or along the interface, might be possible as evidenced by the enhanced photoluminescence signals at these positions. Nature Physics, "Spin–layer locking effects in optical orientation of exciton spin in bilayer WSe2"
Nature Materials, "Lateral heterojunctions within monolayer MoSe2–WSe2 semiconductors"